The on-ball defender goes over a screen on the ball, especially if the ball handler is in scoring range. Here attacker O2 sets a screen for ball handler O1. The defender of the screener, X2, calls "Left" and steps out and hedges in front of the screen to fake a switch or trap, forcing O1 to dribble wide around the screen, and giving on-ball defender X1 room to go over the screen. X2 then drops back quickly to stop a pass to the screener. In the 42 trap-and-rotate defense, X2 would trap the ball with X1. 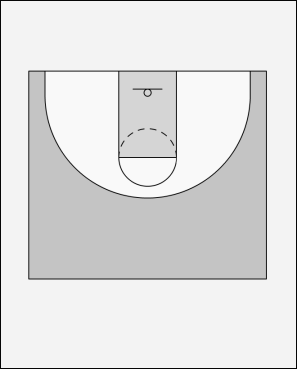 The defender of the cutter goes through the screen or, especially if the cutter is in scoring range, over the screen. Here attacker O1 passes to O2 then screens away for O3. X1, defender of the screener, calls "Left". If X3 (defender of the cutter) calls "Gap", X1 takes a step back to make room for X3 to go between her and the screen, and pushes X3 through on the hip. Otherwise defender X3 goes over the screen, and X1 hedges or "bumps" the cut until her teammate can get around the screen, then steps back. X3 tries to stay with O3, maintaining a ball-you-check position, or instead "tucks and trails" by directly following ("caboosing") the cutter around the screen.